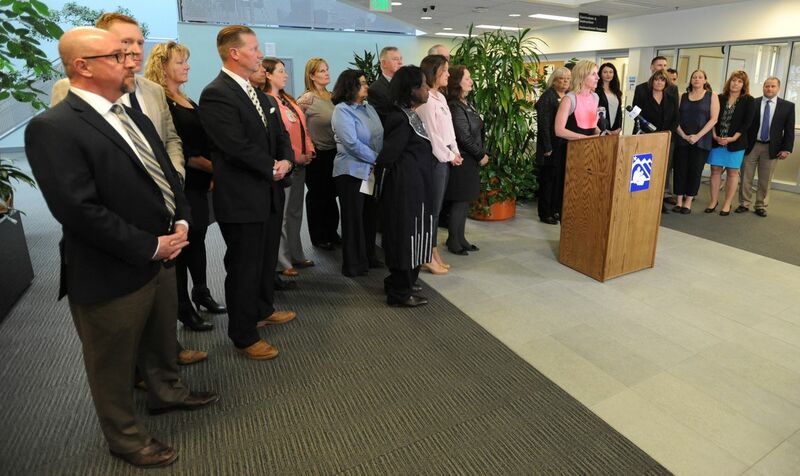 School officials with Alaska's two largest school districts and the University of Alaska Anchorage on Monday rebuked the Senate majority's proposed education cuts in a news conference in Anchorage. Representatives of the three educational institutions said the 5.7 percent funding cut to public schools would lead to increased class sizes, elimination of teacher jobs and the reduction of programs next school year. Meanwhile, the cut of nearly $22 million to the University of Alaska system could mean a midyear tuition increase, the end of certificate and degree programs and continued enrollment declines, university officials have said. "This is a very important time. 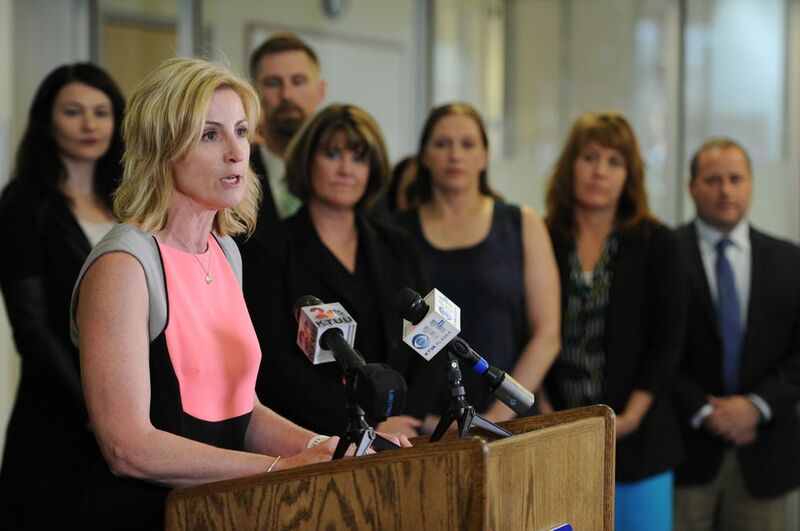 We are here collectively to say, 'We can and we must do better when it comes to funding public education in our state,' " said Anchorage School District Superintendent Deena Bishop. With her at the evening session with reporters were leaders from the Matanuska-Susitna Borough School District and UAA. "Our message is: Do not sell Alaska's students short," she said. Bishop said she could not remember a time when such a wide breadth of educators had joined together at a news conference to advocate for school funding. She was joined by more than two dozen people, including educators, school leaders, union leaders and school board members. She said the proposed budget cuts this year were different than in the past. "The reductions that could possibly be made are being spoken about in whispers in side rooms. We need to know — as the education professionals, as those who push for the future — what future lies ahead," she said. 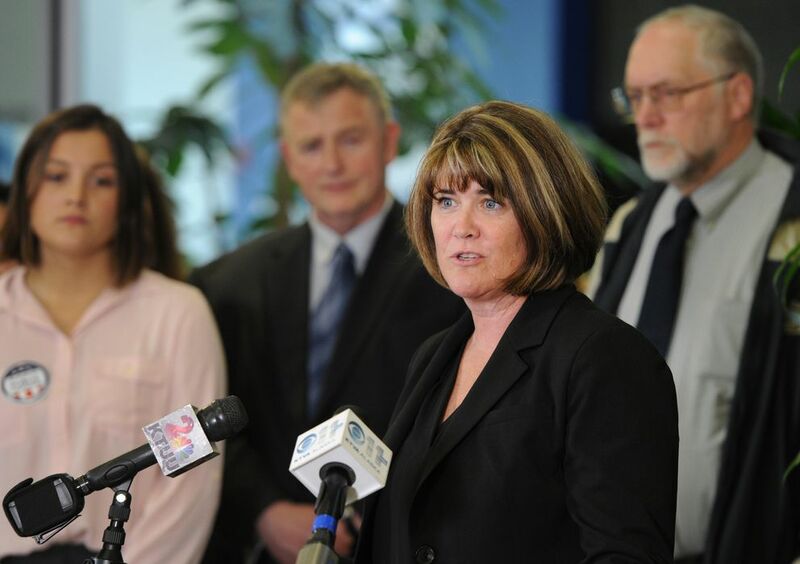 Bishop was Mat-Su superintendent before Anchorage hired her last summer. She also sits on the UA Board of Regents, which governs the public university system. Monica Goyette, Bishop's replacement as Matanuska-Susitna Borough School District superintendent, said the officials were advocating for full funding at the pre-kindergarten to 12th grade level, "and onto the university." "We stand in solidarity today," she said during the news conference at the Anchorage School District's Education Center. In Juneau, the Alaska Legislature has still not agreed on a budget for the upcoming fiscal year, including how to close a nearly $3 billion state deficit and at what level to fund public schools. Gov. Bill Walker and the Democrat-dominated House majority proposed funding UA and public schools at the same level as the current budget year, while the Senate majority proposed a 5.7 percent cut to state funding for schools and a nearly $22 million cut for UA. Senate President Pete Kelly, R-Fairbanks, did not respond to a request for comment Monday, and neither did Eagle River Republican Sen. Anna MacKinnon, co-chair of the Senate Finance Committee. The 5.7 percent funding reduction for public schools would equate to a $69 million cut divided among Alaska's school districts. Bishop and Goyette said the school districts have already prepared budgets for next school year taking into account flat funding from the state, which still would have led to multimillion-dollar shortfalls. "Status quo funding is a significant deficit to education," Goyette said. The Anchorage School Board passed a 2017-18 budget in February that cut 99 full-time teacher positions to partially close a $15 million budget gap anticipated if it received flat state funding. In Mat-Su, the school board passed a preliminary budget in March that called for staff reductions, larger class sizes and cuts to student activities to close an assumed $11 million gap left after flat funding. The 5.7 percent cut proposed in the Senate would mean an additional $27 million budget shortfall for Anchorage School District and the loss of another 200 to 240 positions, according to Bishop. For Mat-Su, it would mean the loss of an additional $12.5 million in funding, more teacher jobs cut and increases to class size, according to the district. About half of Alaska's public school students are enrolled at either the Anchorage School District or Mat-Su School District. Together, the districts employ roughly 8,300 people, including about 4,300 teachers, according to district spokeswomen. Tam Agosti-Gisler, Anchorage School Board president, said state law requires districts to issue layoff notices to tenured teachers by May 15.